Give your guests a jolly reason to smile when you choose Santa Lineup Drink Tickets at your seasonal event. No Christmas party is complete without Santa Claus, and these tickets feature an adorable toy version of the big man in the red suit peeking out from a row of his cohorts against a solid black background. 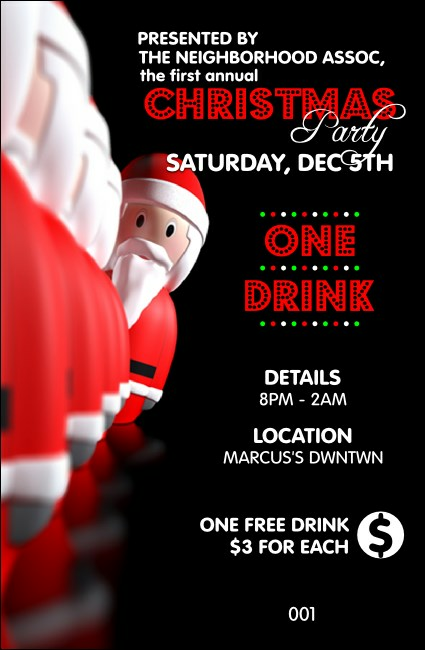 Spruce up your holiday party Santa style with Drink Tickets from TicketPrinting.com.